Imagine what you could do with a frozen pound cake, some sugar sprinkles, melting chocolate and the right cookie cutter! Well, truthfully, you don't have to imagine. 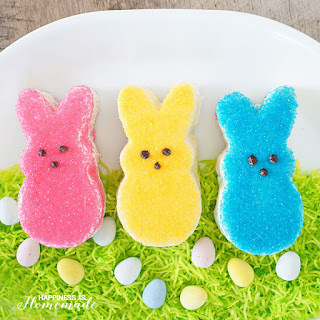 Heidi from Happiness is Homemade gives us easy to follow step by step instructions on how to make these adorable Peep Inspired Bunny Cakes. Aren't they just the cutest little cakes for Easter! Heidi's directions, along with her fabulous photos, show us exactly how to create our own Easy Easter Bunny Cakes that are truly adorable and almost too cute to eat. As you can see in the photo, the colors for the bunnies will only be limited to your supply of sanding sugar colors, but the pastels shown sure do make a lovely presentation. Decorating these bunny cakes could also be a fun event for you and your children. They are so simple to make, it would be the perfect opportunity to work together and encourage your child's creativity. Any child would be quite proud to say they had helped make the Easter treats. Oh, and you will want to have your camera on hand to snap a few shots of them "crafting a bunny cake" for their scrapbooks. The pictures alone will become a treasured keepsake in years to come. Children and adults alike will love these bunny cakes. Plus, they are just the right size for an individual serving, which would make them perfect for a party or Easter celebration at school or home. So, instead of making cupcakes this year for Easter, why not try these precious little bunny cakes? They are sure to be delicious, a pretty table decoration, and an appreciated dessert or treat. These are so adorable. Wish my grandkids weren't so far away. The grandson who is almost 7 would LOVE making these with grandma (and eating them too, I'm sure!). Peeps forever! They're one of those things that will outlast every generation. Love them. An Easter Bunny Cake would be wonderful this year, except now all my grown boys are into healthy foods, I'll have to make it out of vegetables! Well, I have one son left that still can't resist the goodies! These are cute. My kids would have enjoyed making and eating these.